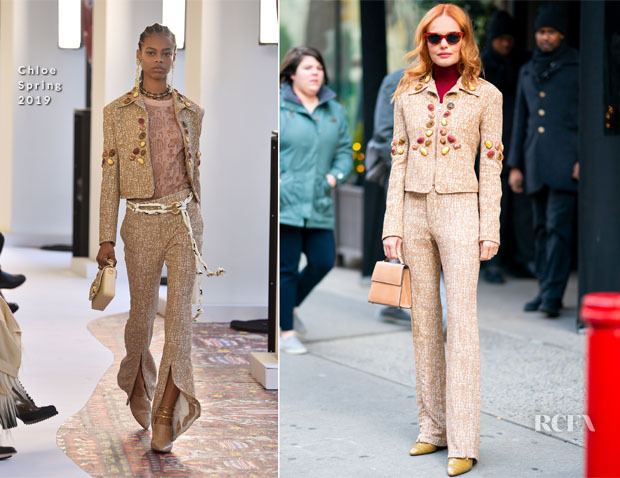 It was a fashion fiesta for Kate Bosworth who showcased fashionable outfit after fashionable outfit while promoting ‘Nona’ on Thursday (December 6) in New York City. Live with Kelly & Ryan: Kicking things off in high style, the actress donned a Chloe Spring 2019 suit with Hunting Season bag and Foundrae Karma Short Stack Signet. With its textured fabric and bold embellishment, the coordinates already made a sophisticated statement but she heightened it with the red roll neck and matching sunglasses. SAG-AFTRA Foundation Conversations: ‘Nona:’ Next up, she dialed up the glamour in a 3.1 Phillip Lim Spring 2019 dress. The wrapped front exposes slices of skin for a sultry reveal and the detail mimics the skirt splices. The white shoes were an interesting choice given the look and season but I understand their addition for tying in the buttons. She also accessorized with white sunglasses outside. Build Series: ‘Nona:’ This whimsical Chloe Resort 2019 dress showcases her auburn hair colour. I’m swept up in the luxurious neutral tones in the outfit. The horse design and contrasting fabric striped sleeves render any other accessories unnecessary. 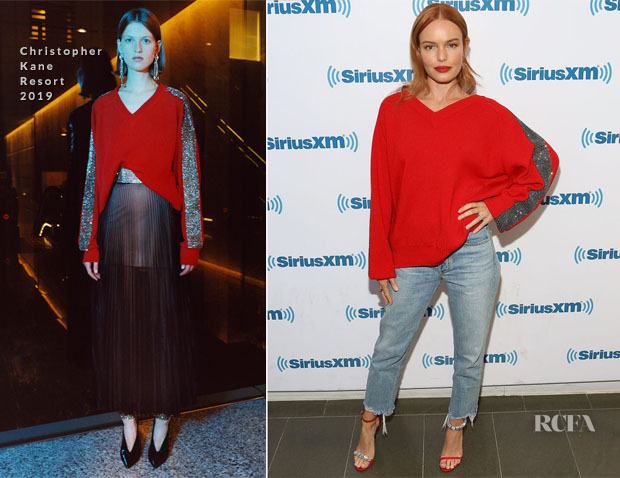 SiriusXM Radio Studios: The actress looked casually chic in a Christopher Kane Resort 2019 sweater with faded jeans. The Calvin Klein shoes brilliantly tie in the top without coming across as too match-matchy. The sweater is styled a lot less formally than the lookbook, but it retains a put-together finish. Late Night with Seth Meyers: Finally, she was ready for evening in a Sally LaPointe Pre-Fall 2019 black papaya metallic jersey twist top and high-waisted zip-front pant. This was another ensemble which showcased her fiery hair colour as much as her fashion credentials. It has the appearance of a chic jumpsuit and the metallic platforms add just the right amount of disco feel. Which ensemble was your favourite?